In his editorial for August 1964, Mississippi Architect editor and Jackson architect Bob Henry calls architects to public service. If you know an architect, odds are, he or she is serving on a board of some kind, whether public or private. Most churches I know like to keep an architect around for advice about their latest building program (advice which they then promptly ignore of course). 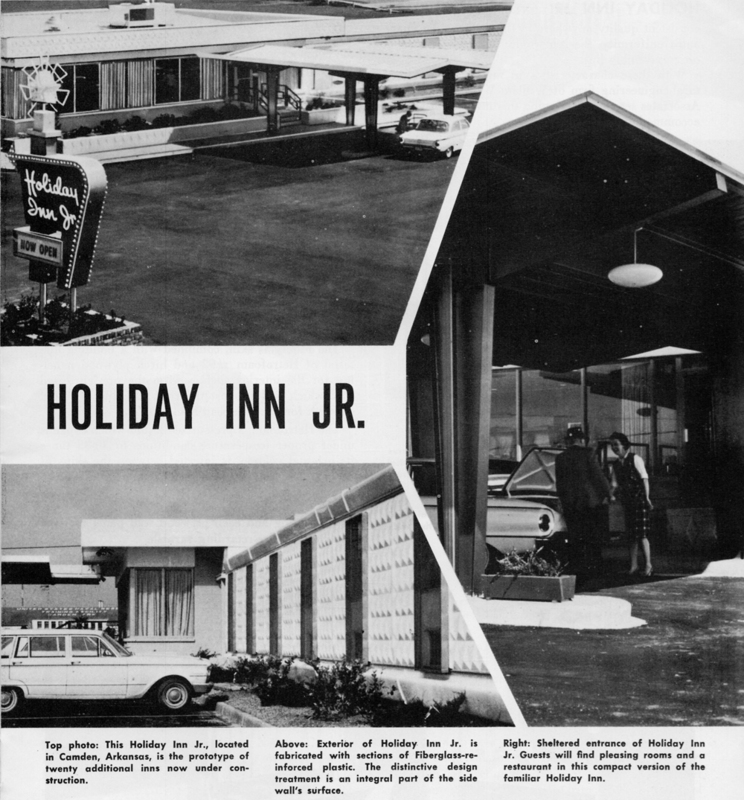 Since this is such a short piece, there’s plenty of room for another article in this issue of Mississippi Architect, “Holiday Inn Jr.” Highlighting an Arkansas building, it’s close enough to Mississippi to be relevant, just a hop, skip, and jump past Greenville, and it should make our modernist readers happy. Plus, it’s name, Holiday Inn Jr., is so doggone cute! It would be interesting to know how many appointed commissions, boards, and committees involving how many people and how many man-hours meet on any given day in the state of Mississippi. There are commissions on aeronautics, athletics, building, educational finance, forestry, history, hospital care, insurance, junior colleges, libraries, marketing, parks, ports, public safety, research, and taxes. There are boards for agriculture and industry, banking, bar admissions, blind and deaf schools, education, eleemosynary institutions, health, institutions of higher learning, mental institutions, oil and gas, penitentiaries, planning, plants, public contracts, textbook purchasing, veteran’s affairs, and zoning. There is the church building committee. Civic-minded citizens by the thousands serve unselfishly and without compensation in the interest of better communities, facilities, institutions, and government. Architects as a profession are committed to the everlasting improvement of man’s total environment. They are morally bound to exploit every opportunity for civic service. Inasmuch as most architects seem reluctant to seek opportunities for service, we suggest that you seek them out and put them to work. They are well equipped . They have been trained to plan, to organize, and to administrate. They use creative imagination in combining function, engineering, and beauty into building projects. Let them use these same talents to serve you. If you need an architect member on your board or committee and there is no architect in your community, contact us and we will recommend one from elsewhere in the state. THREE years ago, the idea for a small·size inn was born. Executives of Holiday Inns, who had already tried their hand at larger inns, decided the time was right for a compact inn with compact rates to match. The unit, to be built in smaller communities or city areas where space is at a premium, would provide adequate accommodations without frills. Swimming pools and meeting rooms would be eliminated to keep the costs down, but it would have all the luxuries found in larger Holiday Inns, only smaller in size and price. At the same time, they wanted the inn facilities to be standardized so that guests could expect the same consistent quality anywhere in the country. To guarantee uniformity, the inn would be best constructed on an assembly line. With these characteristics in mind, the architectural-engineering firm of William W. Bond, Jr., and Associates set about designing this innovation for the accommodations industry. They came up with a modular room which could be produced on an assembly line, transported over the highway to the selected site, and erected with a minimum of on-site construction. The selection of an exterior surface material was made only after considerable analysis of available substances. Since attractive appearance, lightweightness, durability, and easy maintenance were essential to the modular unit, 8 ply, non-toxic Fiberglas was chosen for the exterior skin. They felt this material was unique because a definite pattern could be designed into the surface. The architects knew the exterior color would have to be one that guests would not tire of, so white with its universal eye appeal was chosen. The Fiberglas skin, combined with a bonding material of Hetrofoam #92 and birch plywood paneling for the interior surface form the pre-fabricated wall which will support the roof and give required strength for over-the-road hauling. The Hetrofoam, a pressurized liquid which expands under proper temperature conditions to 30-33 times its original volume, is injected between the skins of the wall panels. The most important physical property is its insulating quality, the architects noted. There is additional insulation in the Fiberglas batts of the ceiling and each plywood wall panel receives five coats of fire-retarding varnish. I had forgotten about the HI jr. There was one in Batesville or Senatobia where my family stayed one night when an ice storm forced us off I-55. I was thrilled because even back then I had some sort of obsession with HI. The place really felt modular. As you walked inside it felt like a line of train cars. The floor would give, the whole place creaked from the wind outside. Freaked my parents out; I thought it cool! Do you have information or history about the original two story Holiday Inn, southwest on Highway 80, Jackson, MS, built in 1962? Re: working with a church Building Committee: in my experience the absolute worst clients I have ever tried to accomodate. Odd, I do not remember ever seeing a Holiday Inn Jr. I have stayed in the regular 1950s or 1960 Holiday Inns, which also had a pre-fabricated look to them, but never the Jr versions. Does anyone know how many were built? As for the interior of the rooms with the mobile-home-style wall paneling, yuck!! The idealism of the first article is so breathtaking I can make no comment. I have a conflict of interest of a sort. As a non-architect, I stand in the ranks of those wanting their free civic services, I suppose. 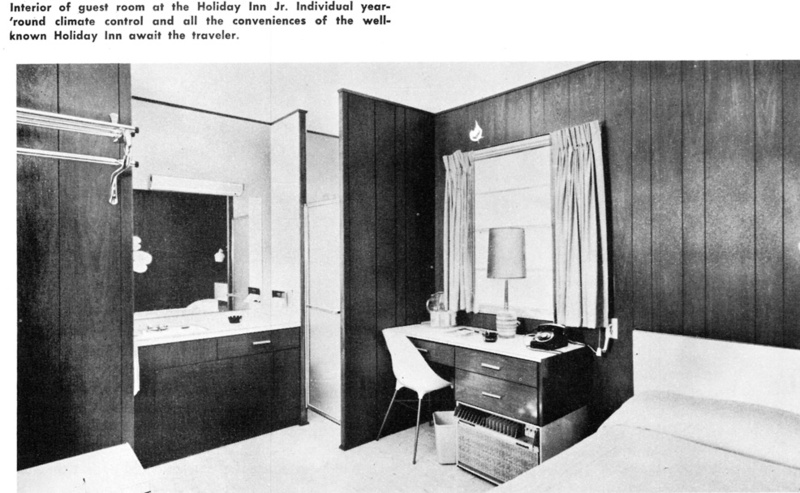 During the 1960s and 1970s there were several Holiday Inn Jr. motels with just 44 to 48 guest rooms located in portables. Locations included Camden, Arkansas, Rantoul, Illinois. Cleveland, Mississippi, Sardis, Mississippi, Farmington, Missouri, Springfield, Tennessee and Columbus, Texas. 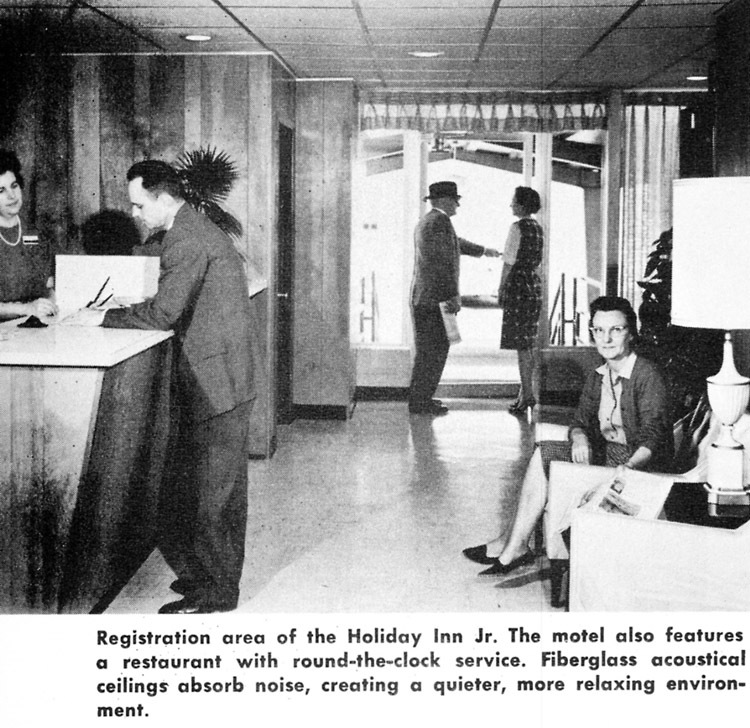 A traditionally constructed lobby building featured a Holiday Grill restaurant. The Camden location had just 32 rooms while the Rantoul location had 64 rooms. Rusty memory…The one where we stayed must have been at a Sardis exit. It is surprising that the idea did not really take off. Perhaps the public wasn’t yet ready for the idea, but economy lodging certainly wasn’t off the radar of the public at the time. Witness the growth of Motel 6, Days Inn and others in the 1970s and it is a surprise that Holiday Inns did not pursue this more aggressively. Of course, the company did lose its way to a certain extent in the 1970s, pursuing non-core assets like the Delta Steamship Company with its freight/passenger ships to South America. The Holiday Inn Express was introduced much later- after the company had been sold and reorganized. Of course, the Holiday Inn Express has been a resounding success for them while many “legacy” Holiday Inns have had to be retired or even remodeled into “Express” hotels themselves. I could go on forever here…Great article! I was surprised to learn that this building is still standing. While its changed quite a bit and is a little rough around the edges, the distinctive canopy still stands out front. Some of the fiberglass panels survive above the restaurant portion of the building. Ive uploaded some photos to the link below.